75964-04 5 Copper 40 10 5th Post is "E"
75964-09 5 Copper 35 5 5th Post is "E"
Custom beryllium half ring grids, 3mm diameter. Custom copper 5-post lift-out grids specially designed for in-situ lift-out. These grids include multiple indexed mounting locations, all with vertical bars attachment surfaces. Now with lower profile sides for easier access to outermost posts 3mm diameter. Custom 4-post lift-out grids for in-situ lift-out. Include multiple indexed mounting locations, two with vertical bars attachment surfaces and two with “V” shaped alignment surfaces. Sides have lower profile for easier access to outermost posts. 3mm diameter. 3 post copper lift-out grids specifically designed for in-situ lift-out. 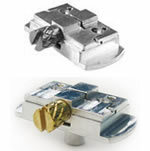 These grids include multiple indexed mounting locations with both vertical bar and "V" shaped attachment surfaces. These grids have a shallower downset and slightly wider center post than 75964-01. Packaged in glass vials. 5 post copper lift-out grids specifically designed for in-situ lift-out. These grids include multiple indexed mounting locations, all with vertical bar attachment surfaces. Now with lower profile sides for easier access to outermost posts. 3mm dia. Packaged in glass vials. 4 post copper lift-out grids specifically designed for in-situ lift-out. These grids include multiple indexed mounting locations, two with vertical bar attachment surfaces and two with "V" shaped alighment surfaces. Sides have lower profile for easier access to outermost posts. 3mm dia. Packaged in plastic vials. 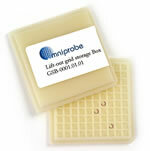 Storage box for 100 standard or half grids - 3 mm diameter– TEM grids. Box comes complete with base, lid and clips. Post Base TEM Grid Holder. Available with two versions: stainless steel (SS - very slightly magnetic), can affect imaging in UHS mode; and aluminum (Al - non-magnetic). Short post – standard is 1/8” (3.2mm) diameter x 0.15” (4mm) length. TEM grid holder with stations for 2 TEM grids and 2 sample stubs. Available with two versions: stainless steel (SS – very slightly magnetic), and aluminum (Al – non-magnetic). Long post – standard is 1/8” (3.2mm) diameter x 0.32” (8.1mm) length. Comes with 2 sample stubs. For 2 TEM grids and 1 sample Pin Stub. Stainless Steel (very slightly magnetic), and Aluminum ( non-magnetic). Long post – standard is 1/8” (3.2mm) diameter x 0.32” (8.1mm) length. Comes with an aluminum sample stub. Single TEM Grid Holder is made from aluminum with steel spring, holds one 3 mm TEM grid by the spring loaded vise, and has a raised edge which protects the sample from accidental damage. 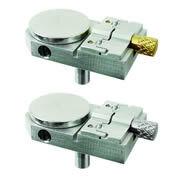 The holder has a 1/8” (3.2 mm) diameter x 0.32” pin (8.1 mm) length pin. It fits most standard pin stub holders. The Sample Holder Base securely holds the Single TEM Grid Holder above, under a stereomicroscope and permits viewing from two angles without changing focus. This station is meant for 2 TEM grids and 1 sample Pin Stub. Available in two versions: Stainless Steel (SS – very slightly magnetic), and Aluminum (Al – non-magnetic). Long post – standard is 1/8” (3.2mm) diameter x 0.32” (8.1mm) length. Comes with an aluminum sample stub. Frontside Thinning, 45°, TEM sample grid coupon designed specially for use in the Short-Cut™ tool. 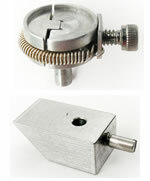 The center portion is a standard 3 mm grid into which the sample loaded needle is swaged and cut 45°. Available in two versions: One make from pure copper and the other is molybdenum coated copper. Backside Thinning, 45°, TEM sample grid coupon designed specially for use in the Short-Cut™ tool. The center portion is a standard 3 mm grid into which the sample loaded needle is swaged and cut 45°. Available in two versions: One made from pure copper and the other is molybdenum coated copper. Frontside Thinning, 26.5°, TEM sample grid coupon designed specially for use in the Short-Cut™ tool. The center portion is a standard 3 mm grid into which the sample loaded needle is swaged and cut 26.5°. Available in two versions: One made from pure copper and the other is molybdenum coated copper. Backside Thinning, 26.5°, TEM sample grid coupon designed specially for use in the Short-Cut™ tool. The center portion is a standard 3 mm grid into which the sample loaded needle is swaged and cut 26.5°.